Attend this workshop to learn tips on how to create a more competitive application for the Gilman Scholarship! The Gilman is intended to help students have a study abroad experience. Open to all Pell Grant recipients interested in studying abroad! 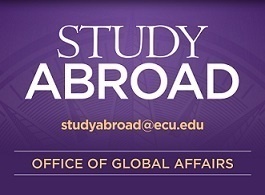 Contact ECU Education Abroad for more details.